At approximately 10:18 a.m., on Sunday, March 31, a fire was reported in the area of 189 Park Avenue, also known as Body Beach. The first arriving Battalion Commander reported that there was an active brush fire in high dense salt cedar brush and the fire was intensifying with the high winds. The winds caused the fire to move rapidly along the shoreline to the area just north of the Havasu Riviera Project. The fire was monitored as it advanced, while resources conducted exposure protection at the State Water Safety Center at Contact Point. Three Engine Companies and two Battalion Commanders initially responded to the fire, with a second alarm to staff additional Command Officers at the scene, and to recall off-duty firefighters to staff reserve apparatus for the remainder of the City. 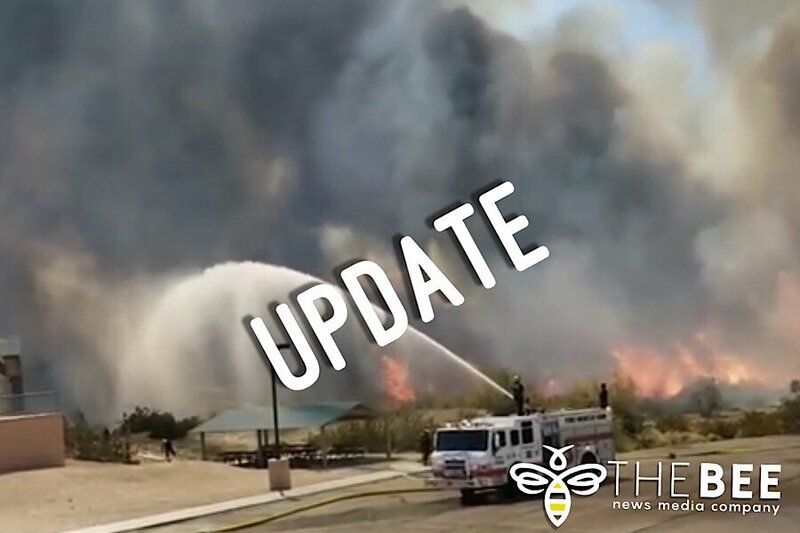 Additional resources were requested from Buckskin Fire, Desert Hills Fire, Yucca Fire, Golden Valley Fire, San Bernardino County Fire, and Lake Havasu City CERT. State and Federal resources from Arizona Department of Forestry and Fire Management and the Bureau of Land Management (BLM) were also requested. State Highway 95 was closed in both directions from Mulberry Avenue to Acoma Boulevardduring the early stages of the fire due to smoke on the highway. BLM fire crews set backfires to strengthen natural breaks and the fire was deemed under control at approximately 3:00 p.m. Damage was limited to approximately 80 acres of shoreline brush and no injuries were reported. The incident was transferred to BLM and State Fire Crews at approximately 5:15 p.m. These crews will be in the area for a few days to handle hot spots. Residents can expect to see minor smoldering in the area while this work is completed. The cause of the fire is under investigation by BLM Law Enforcement. For further information, contact the Lake Havasu City Fire Department at 928-855-1141. Send us a message with news or questions. We'll get back to you as soon as possible with a response.